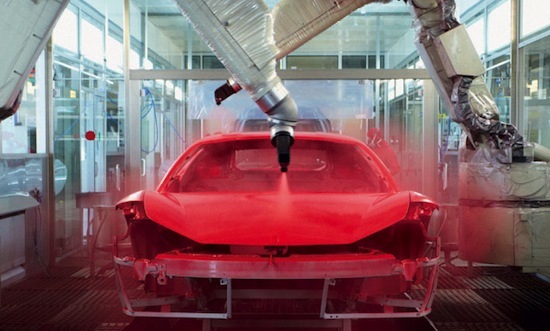 Ferrari has introduced a new low-temperature paint process, designed to deliver better uniformity across components and a lower environmental impact. Developed in partnership with PPG Industries, the new paint finish is called ‘Low Cure’ clear coats. It relies on a specially formulated clear coat, which allows Ferrari to bake the paint at 100 degrees instead of 150 degrees. That lowers the amount of energy required to paint a car and, by extension, lessens the environmental impact of the process. Apart from this, Ferrari says it promotes better cross-coat linking, which reduces the paint’s water permeability. Because it’s now possible to bake carbon-fiber and composite body parts at the same time as the body shell, helping deliver better color continuity between parts of different materials. The process has been completely industrialized for 61 different base-coat colours, created by combining different metallic pigments with a gloss- or matte-accented clear coat.